“Blessed are those who find their strength in You, whose hearts are set on pilgrimage.” Psalm 84. Pilgrimages are as old as time itself and of almost universal significance. They were much part of the Celtic tradition. It is said that all pilgrimages spring from a deep yearning for an encounter with the Divine. This yearning draws people to special places associated with the Divine, whatever their faith. To be a pilgrim is to invite change, conversion, new perspectives, a deeper life. encounter the legends of Brigid and their relevance for today. Solas Bhride Centre offers a variety of pilgrimage experiences. 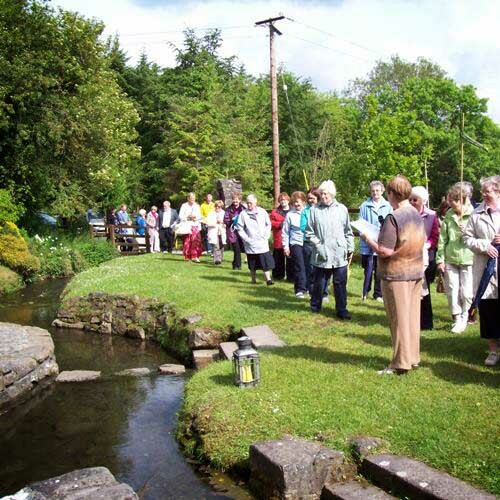 As well as the visit to Solas Bhride this option also includes a visit to St. Brigid’s well for ritual and reflection. Booking is required for the above group pilgrimage experiences. Individual pilgrims/visitors are welcome to visit the Centre during opening hours. “We are only stirred by the very places that bear the footprints of those we love or admire.” Cicero.